Looking for things to do while visiting the Mendocino, Sonoma County coastal regions? Below is a listing of events scheduled. Please note that fireworks during the Independence Day 2015 Events in Mendonoma may be scheduled on a day other than the traditional July 4th. an amazing Fireworks display off the end of the City Pier in Arena Cove! Point Arena is just 15 minutes away from The Sea Ranch. Celebrating Independence Day 2015 Events in Point Arena is a delightful small town experience. Events include parades down main street. Then there’s the community block party in the harbor. Here kids and adults alike enjoy eating cotton candy, barbecue manned by the Redwood Coastal Volunteer Fire Department, and abalone chowder (made from abalone confiscated from poachers as well as donated by local divers) and dancing in the streets. Later as the sun goes down over the harbor the sky is lit up by fireworks. A fun time not to be missed if staying Abalone Bay in Sea Ranch! (Mayors of Toronto, Brubaker, The Louies, Carne Cruda), crafts and activities, and a wide selection of food & drinks. Fun for all ages!! Fireworks show by PyroSpectaculars will begin at dark! BRING FLASHLIGHTS and JACKETS !! Parking is limited/Shuttle Bus available. Food, music, and hanging out in the Point Arena Park after the Parade. Featuring local music and local food. Somewhere around 2000 people (many times the population) line the streets of Mendocino (Main St. & Lansing St.) to watch this kooky hometown parade. Come early to get a good spot. Parking is available on any side street, just don’t block a driveway. Family fun continues from 1-4pm at the Mendocino Art Center for Jazz on the Lawn, enjoy music and dancing, barbecue, soft drinks, beer and wine. Join the fun at this annual event, sponsored by the Salmon Restoration Association to raise money to take positive action to restore salmon to our rivers and streams. Great food, live music and a love of the outdoors are all part of the atmosphere at the barbeque. Trade fish stories with an “old salt”, or join one of our younger attendees in learning about the efforts of the Salmon Restoration Association. What’s on the Menu? Delicious Grilled Salmon, Fresh Green Salad, Good ole’ Corn on the Cob and Garlic Bread. 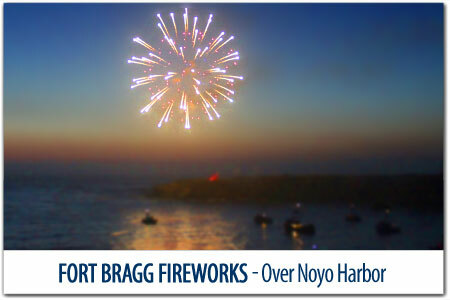 Fort Bragg will celebrate with fireworks at Pomo Bluff Park. 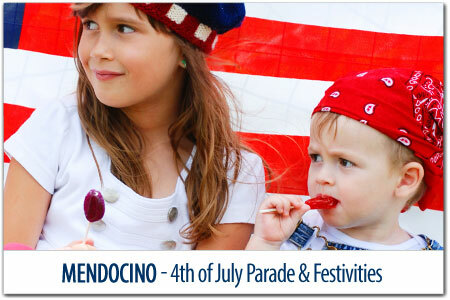 The Mendocino Coast loves to celebrate all weekend long! So come early, see fireworks over the ocean in Fort Bragg, along the ocean side of Pomo Bluffs on Todd’s Point at dusk to watch the fireworks! Walk-in only after 5pm. The show starts at dark (approx. 9:30 p.m.), with a spectacular, free firework display over the water. For prime viewing, plan ahead and reserve a dinner table at one of the many bay-front restaurants around Bodega Bay, such as The Boat House, The Tides Wharf, Spud Point Crab Company, Duck Club or Lucas Wharf. It’s fireworks over the river, and a “Parade of Lites” on the river, for this family friendly gathering on Friday, July 3, when groups unveil their homemade floats bedecked in lights and perform skits while floating past a cheering audience. That’s followed by a free show at the town’s famous water curtain, as images of the American flag are projected off the Monte Rio bridge, and then the dramatic fireworks display. But the fun runs all day, and all day Saturday, too, starting at 11 a.m. both mornings for Big Rocky games, a firehouse barbecue, horseshoes and volleyball. Details: Monte Rio Beach, 20488 Hwy 116, Monte Rio, (707) 865-9956. 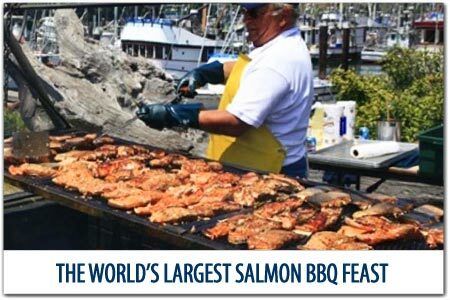 This free event is a highlight of the year for this playful waterfront town, as the Russian River Chamber of Commerce puts together an all-day celebration of all things fun. Plan to arrive early in the day, to explore the downtown wonderland of shops, restaurants, bars and art galleries. The Russian River Rotary is hosting a barbecue, and live music continues into the evening with kids’ activities and a block party. At dusk, the crowds gather along Main Street for the fireworks over the river show. Details: Downtown Guerneville, 707-869-9000, russianriver.com. The party starts at 3:30 p.m., when the gates open at the Veteran’s Memorial Building across from the Sonoma Fairgrounds, and the crowds start claiming their spots with blankets and folding chairs. It’s an entire day of fun for the whole family, featuring multiple local bands, local food vendors, and for the kids, a watermelon eating contest, jumpy houses, face painters and clowns. Then, after the sun goes down around 9:30 p.m., the evening explodes with fireworks show simulcast live to music by KZST 100.1 FM. Please note that jackets are recommended for chilly night temperatures, and drink coolers are welcome, but alcohol is not. Admission is $10 ages 12+; $5 veterans; $5 ages 5-11; free ages 0-4. Parking is $5. Details: 1351 Maple Ave., Santa Rosa, srboom.com.